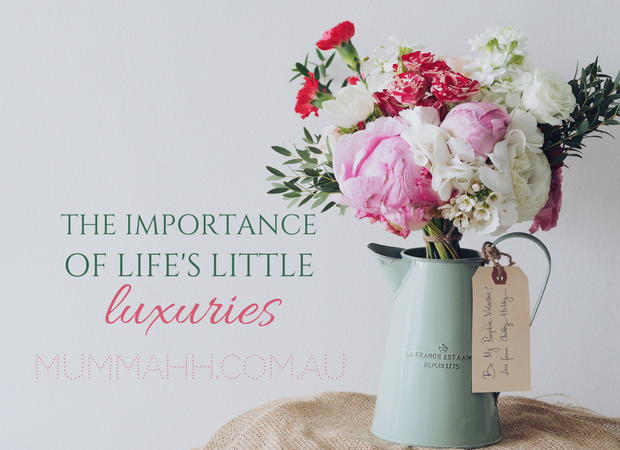 The importance of life’s little luxuries. June 11, 2017 Lifestyle, Win 1 Comment on The importance of life’s little luxuries. I love candles and wax melts, they fill the house with beautiful ‘smells’. I’ll often tell my kids, particularly my daughter that they are ‘in charge of smells’, and they will pick a wax melt scent or candle to burn. The great thing is that little luxuries like these don’t have to cost the earth, and they can really make you feel so much better. Another little luxury I insist on is good quality toilet tissue paper. We have two toilets in our house, one is the ‘girls’ and the other is the ‘boys’. As you can imagine this isn’t strictly policed and I often find my two sons using the ‘girls’ toilet because it’s usually much nicer than their toilet. The ‘girls’ toilet has candles, reed scents, quality toilet tissue (which is always on the roll!) and always has a nice fresh hand towel. New research has revealed that a significant proportion of Australian women are investing in “affordable luxuries” for a daily mood boost and as a means to increase their overall levels of psychological wellbeing. 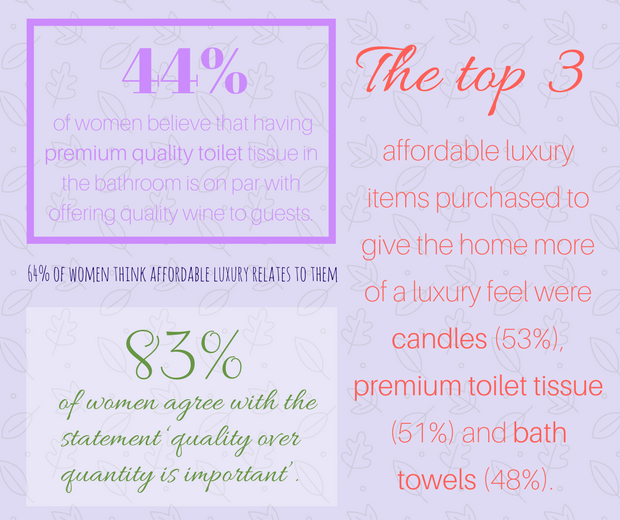 The research conducted by Emporia, luxury toilet tissue paper company, found that 79 per cent of women say buying an affordable luxury item makes them feel happy and 18 per cent say they feel empowered. However, despite this finding, the majority of women (51 per cent) ‘rarely’ or ‘never’ make an affordable luxury purchase. The Emporia research aims to uncover the role affordable luxury plays in women’s lives. The research findings are re-assuring. When I need a little pick-me-up I find affordable luxury items are the perfect mood booster. There’s nothing like buying a new lipstick or nail polish, and when I can I love to buy fancy shampoo and conditioner (from the hairdresser! ), which I stash away in the shower – just for me! What I found interesting was that this research found that most women take into consideration what others think when it comes to the quality of their household items. 51 per cent of women believe their guests would notice if they had cheap household items such as toilet paper or soap and in a bid to attain the affordable luxury ‘look’, almost 1 in 3 women confessed to filling an old expensive hand wash bottle with a cheaper hand wash. This made me laugh because I am that 1 in 3 who fills up the fancy bottle with the cheaper hand wash, it may be a little superficial but it just makes the bathroom look good. If we have guests, I always make sure that the bathroom is clean, with fresh soap (a nice fancy brand), a ‘good’ hand towel and quality toilet tissue! Dr. Green says that while it could be argued that “keeping up appearances” is a key driver for having affordable luxury in the home – which may seem superficial – the research supports that savouring simple pleasures is a proactive investment in boosting your feelings of empowerment and happiness. Meet your inner leader. She’s in there; she just needs a little nudge, some cheerleading maybe – but never doubt she’s there! One proven psychological strategy that will help you find her is the “Best Possible Self” exercise. Simply take some precious time out and do some journaling to describe you at your best! Then create a plan of action to bring her to life! Discover strengths you didn’t know you had! So many women are focused on what they’re not good at rather than what they are good at! Identify what makes you strong and unique and create a life and career around these strengths. Pay it forward. Each woman that discovers her inner strength and empowerment has the capacity to help other women do the same. Remember there is strength in numbers! Build physical and mental toughness! Whilst many women are discovering that having physical strength helps them feel empowered, even more important is having the skills of mental toughness! Developing a growth mindset (or can-do approach) is one key skill of a mentally tough person. Have hope! Significant amounts of research show that “high hopers” not only smash their goals but experience higher levels of wellbeing in doing so. High hope means developing personally meaningful goals to work towards, having a belief that you can achieve them and having “multiple pathways” to get there i.e. a plan B, C and D! Life’s little luxuries are important and now we know that treating yourself is actually good for your psychological wellbeing. You don’t have to spend a fortune to boost your mood, it could be getting that luxury toilet tissue! 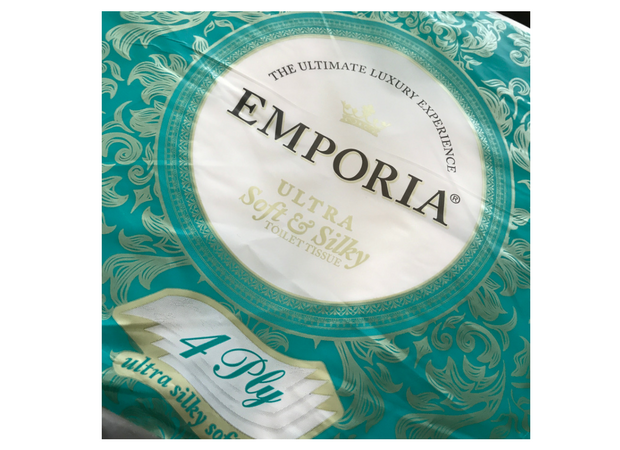 And by the way, I picked up some of the Emporia toilet tissue in the shopping last weekend and I have to say it is indeed very luxurious. If you would like to try some, well here is your chance! Head over to the Emporia Facebook page to enter their competition and you can win an Emporia Luxury Hamper pack to the value of up to $130. Take care of yourself, because you deserve it! This post is brought to you by Emporia, however the post is written by me and all views expressed are entirely my own. 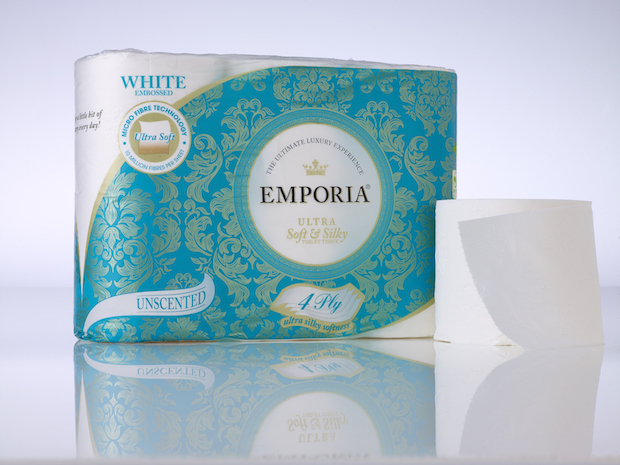 Furthermore I have tried Emporia toilet tissue and it is in my opinion very luxurious. About Emporia – Experience EMPORIA toilet tissue and understand the true meaning of ‘everyday luxury’, with its 4 layers of extra thick, silky and soft tissue. Hi, I tried the tissues once and not llikely to again, my usual brand is much softer and silkier on my skin. Based on the tissue experience would not be tempted to try the toilet paper. 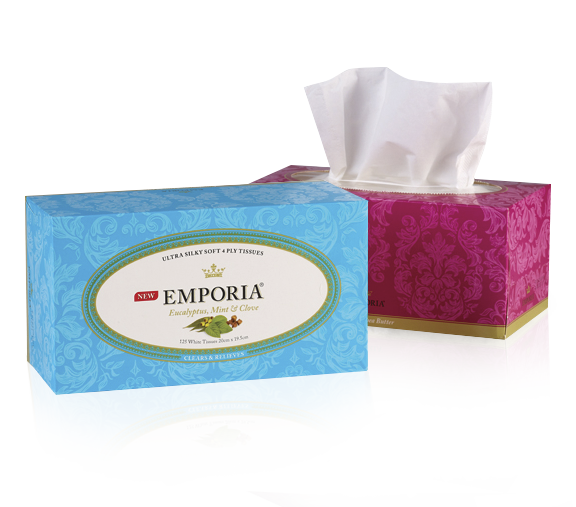 Curious as to whether you have tried the Emporia tissues and if so, how you found them?